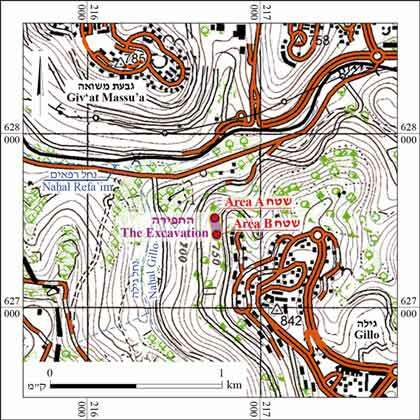 In February–March 2014, a trial excavation was conducted northwest of Jerusalem’s Gillo neighborhood (Permit No. A-7052; map ref. 216753/627598; Fig. 1), prior to the construction of a new residential neighborhood. The excavation, undertaken on behalf of the Israel Antiquities Authority and financed by the Ministry of Construction and Housing, was directed by I. Zilberbod, with the assistance of N. Nahama (administration), A. Hajian and M. Kunin (surveying and drafting), A. Peretz (field photography), J. Bukengolts (pottery restoration), C. Amit (studio photography), C. Hersch (pottery drawing) and E. Belashov (plans). 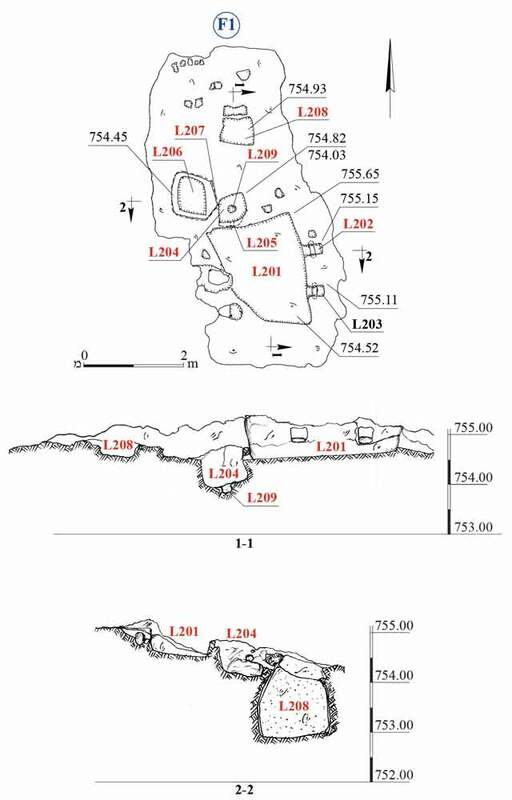 Two excavation areas (A, B; Fig. 2) were opened c. 600 m apart on the western slope of a hill that descends to Nahal Gillo and Nahal Refa’im. Area A, which extended across a steep slope, was divided into three secondary areas (A1–A3). This area yielded remains of tombs, including shafts, caves and niches hewn in chalk bedrock, as well as a quarry that damaged the ancient tombs. Based on the ceramic assemblage discovered in the tombs it seems that they were hewn in the Intermediate Bronze Age and were reused in the Iron Age II. Several pottery sherds ascribed to the Early Roman period were discovered in soil fill above the quarry and probably date the time of the quarry. Two long agricultural terrace retaining walls of unknown date (W1, W2; width 0.5 m, preserved height 0.3–2.0 m) built of two rows of stones were visible on the surface of Area A. Parts of the walls were constructed on the quarry. Area B extended along a more moderate slope where three rock-hewn installations (F1–F3) were exposed. 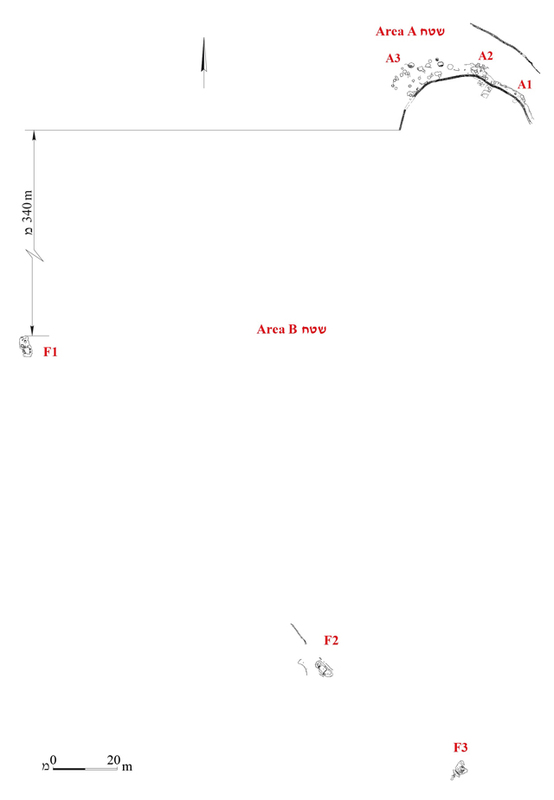 Area A1 (Fig. 6). 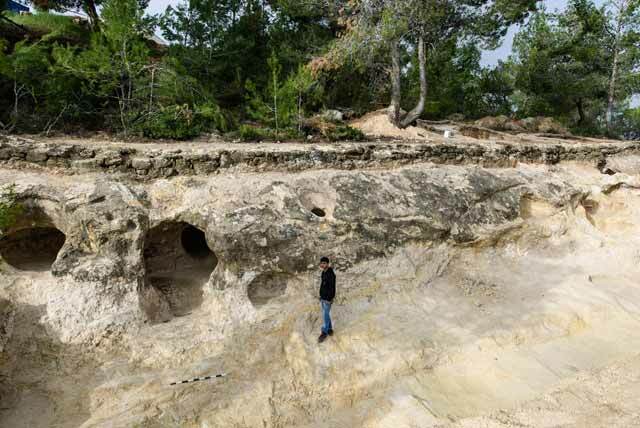 Two caves (T14, T15) that were discerned on the surface were exposed. They were partly natural and partly hewn. Part of the wall of a rock-cut shaft (L10; depth c. 1 m; Fig. 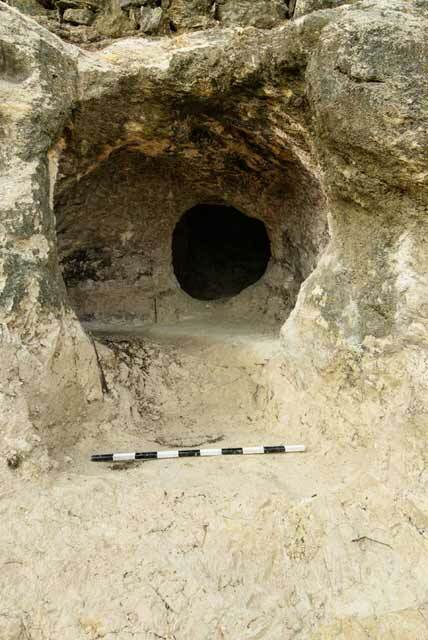 7) and the interior of the cave (L15; c. 1.5 × 1.5 m, height 1.5 m) were all that survived of Cave 15. The bottom part of a vertical rock-hewn shaft (L11; diam. c. 1 m) that led to a hewn cavity (L12; c. 2 × 2 m, depth c. 1.5 m) was preserved from Cave 14. 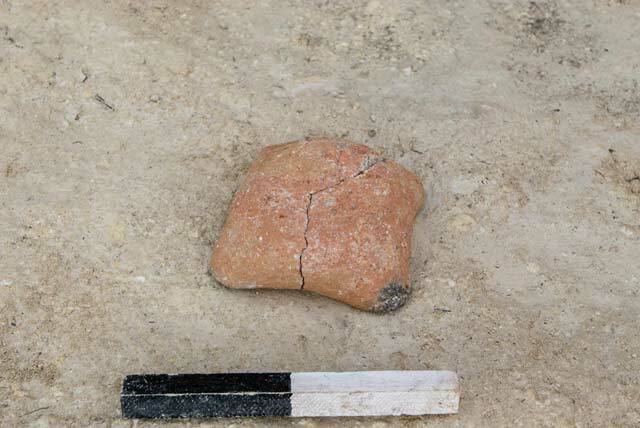 Fragments of a cooking jug from the Iron Age II (Fig. 8:4) were found in Shaft 11. The rim of a similar cooking jug (Fig. 8:5) and two bowls (Fig. 8:1, 2) dating to the Iron Age II were discovered in Cavity 12. 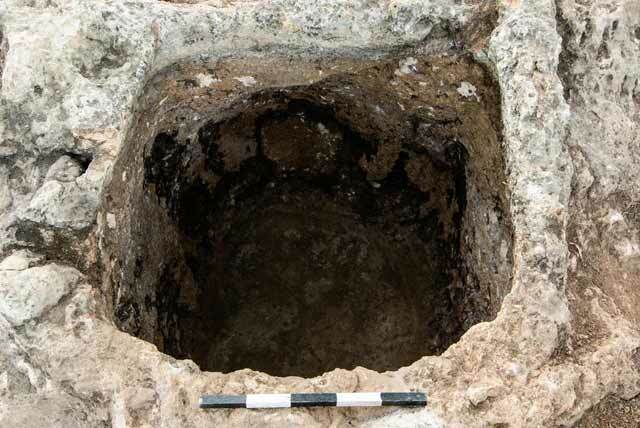 An opening hewn in Cavity 12 led to another cavity (L16; c. 1.5 × 2.0 m, depth c. 1.5 m), in which a bowl (Fig. 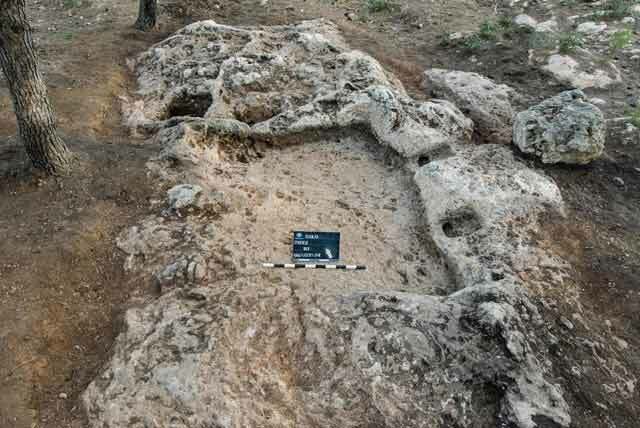 8:3), also dating to the Iron Age II, was found. The opening of another shaft (T13; diam. c. 1.5 m) and a vertical shaft (T12; diam. 0.6 m, depth 0.9 m) leading to another cave that was not excavated were discovered north of Cave 14. Area A2 (Fig. 9). Just north of Wall 1, in the northwestern part of the area, was a rock-hewn vertical shaft (T6; diam. c. 1.1 m, depth 2 m) that led to a cave, not excavated. The opening to the cave (height 0.4 m), which was discovered sealed with a roll-stone, was hewn at the bottom of the shaft’s southern wall. The upper part of the shaft was damaged by a later quarry (L31). 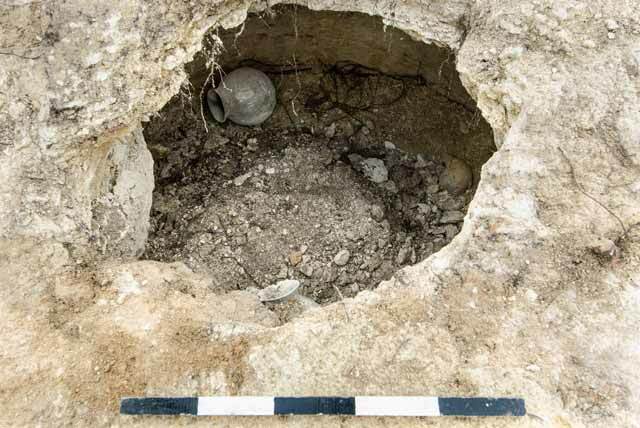 An accumulation of soil mixed with pottery sherds from the Intermediate Bronze Age was found in the shaft. Two other rock-cut shafts (T9—diam. 0.7 m, depth 1.2 m; T10—diam. 0.9 m, depth c. 1 m) were discovered slightly east of Shaft 6. North of Shaft 6 were two partially collapsed caves (T4—c. 1.5 × 2.5 m, excavated depth 1 m; T20—c. 1.5 × 1.5 m, excavated depth 1 m), the preserved floors of two additional caves (T18, T19; diam. c. 1.25 m; Fig. 10) and a small niche (T7; c. 0.5 × 0.9 m; height 0.45 m). A complete lamp (Figs. 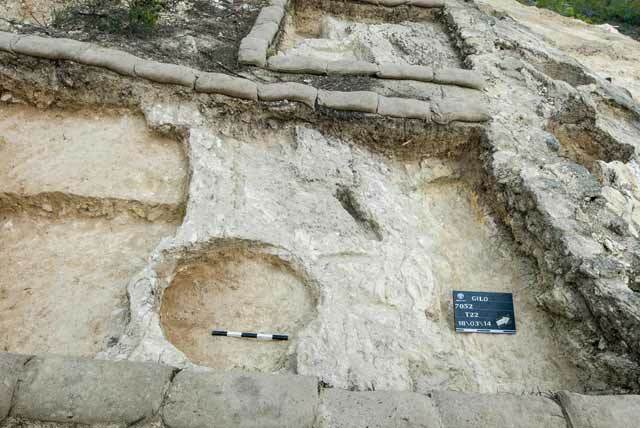 11, 12) dating to the Intermediate Bronze Age and human bones were found in situ on the floor of Cave 18. 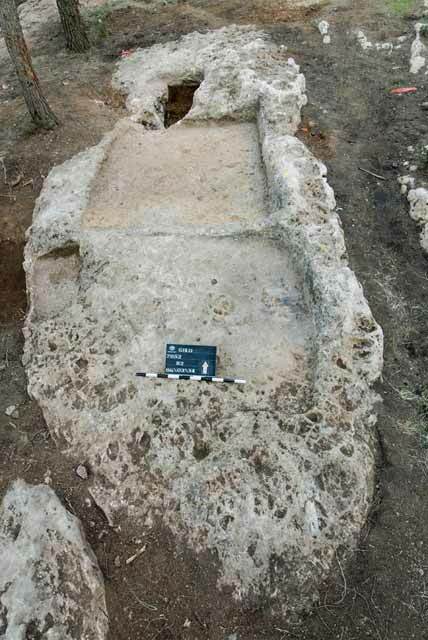 A complete amphoriskos dating to the Intermediate Bronze Age (not drawn) was discovered in Niche 7. 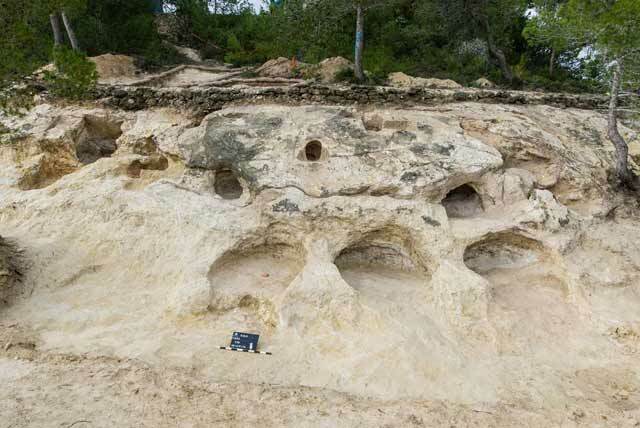 In the southeastern part of the area were rock-hewn niches (T5—c. 0.15 × 0.20 m, height c. 0.3 m; T16—c. 0.75 × 0.80 m, height c. 0.5 m) and a cave (T17) that had collapsed; hence, only the opening of the cave (L43) was excavated. The bottom part of an Iron Age II dipper juglet (Fig. 13) was discovered in the opening of Cave 17. A rock-hewn burial shaft (T22; diam. 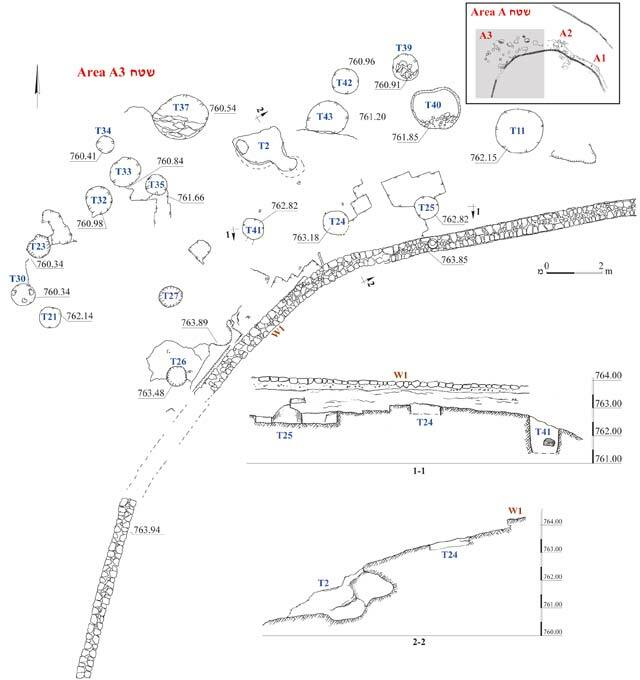 c. 0.6 m, excavated depth 0.2 m) was uncovered south of W1; the upper part of the shaft (L55, L56) and the ceiling of the cave to which it led were severed by the hewing of a later quarry (L46, L47; Fig. 14). 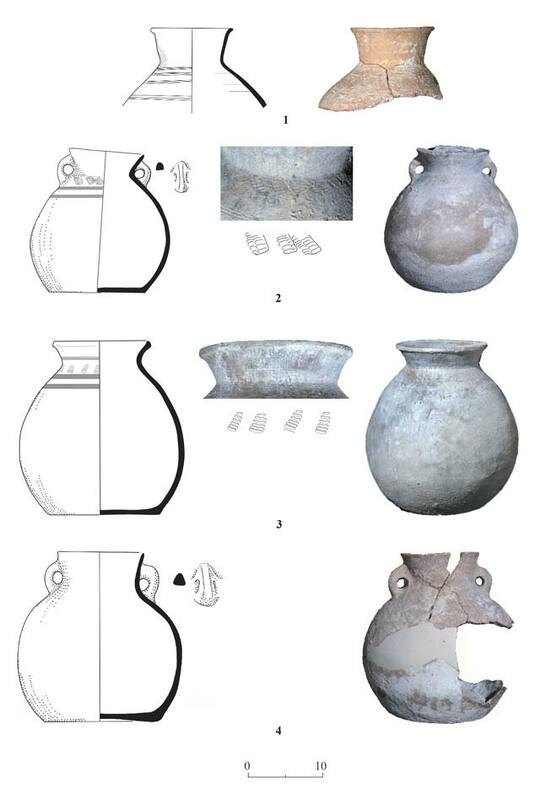 Several pottery vessels from the Intermediate Bronze Age were discovered in Tomb 22, including a jar (L55; Fig. 15:1) and three amphoriskoi (L56—Fig. 15:2, 3; L49—Fig. 15:4). Additional remains of the quarry (L30, L31) were found near the southern side of W1. Area A3 (Fig. 16). Four rock-hewn shafts that were not excavated (T24–T27; diam. c. 0.9 m) were exposed next to W1; some of them had sustained damage caused by hewing in a later quarry. Six additional shafts (T21, T23, T32–T35) were revealed west of these shafts, at a lower elevation. Next to the shafts in the western part of the area was a burial cave whose ceiling had collapsed (T30; Fig. 17), in which fragments of two jars from the Intermediate Bronze Age (not drawn) and a human skull were found, and shafts and caves, which had collapsed or were severed by the later quarry. A cave (T2; 1.5 × 2.5 m, depth c. 1.5 m), revealed prior to the excavation, was exposed in the center of Area A3, devoid of artifacts. It had a small niche hewn in its southern wall. The floor of another cave (T37; diam. c. 2 m) was exposed northwest of Cave 2. The floors of three more caves (T11, T40, T43) and the openings of two shafts (T39, T42; diam. c. 1.1 m) were exposed in the eastern part of the area. Pottery from Area A. 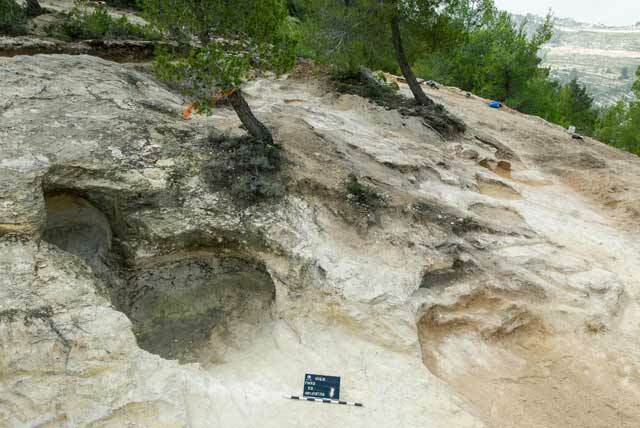 Ceramic artifacts dating to the Intermediate Bronze Age and the Iron Age II were discovered in the tomb remains in Area A, in the shafts, caves and rock-cut niches. These finds suggest that that the tombs were hewn in the earlier period and reused during the Iron Age IIb. The ceramic assemblage from the Intermediate Bronze Age (Figs. 12; 15:1–4) is typical of ware from the southern group according to Amiran’s division (Amiran 1971:99–105, Pl. 22) and includes handle-less jars, amphoriskoi and four-spouted lamps bearing traces of soot. The lamps may have been used during a ceremony that preceded the burial. No exact parallels were found for the decorations on the amphoriskoi from T22 in Area A2 (Fig. 15: 2, 3) even though during this time, punctures and incised decorations on vessels were not diverse. Similar decorations on vessels were discovered in the northern regions of the Judean Hills, for example at a site on the eastern slopes of the Mount of Olives (Ras el-‘Amud; Strata V and VI; Permit Nos. A-5468, A-5535), in tombs at Efrat (Gonen 2001: Figs. 14, 19, 21) and at Khirbet Kūfin (Smith 1962: Pls. X–XII). The Iron Age IIb ceramic assemblage is meager (Figs. 8:1–5; 13) and characteristic of the pottery of Judah in general and Jerusalem in particular, during the second half of the eighth–first half of the seventh centuries BCE. 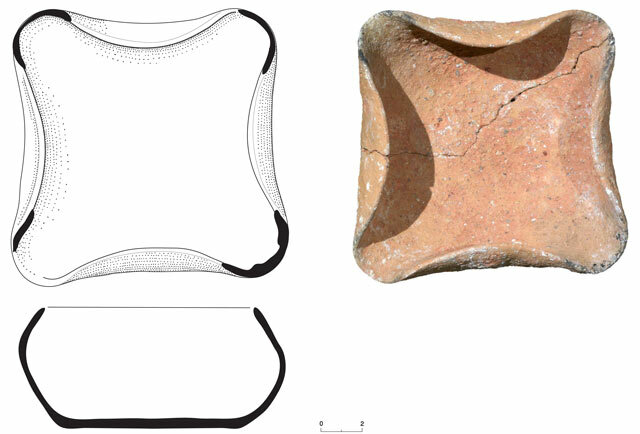 It includes thin-walled deep bowls with a pointed rim known as rice bowls (De Groot and Bernick-Greenberg 2012:61–62, Type B7), cooking jugs with a folded rim, a holemouth base, fragments of a bag-shaped jar and a cylindrical dipper juglet. This assemblage is common in the City of David, Strata 11–12B (Area E in Y. Shiloh’s excavations; De Groot and Bernick-Greenberg 2012) and in loci attributed mainly to the eighth century BCE in the Ofel excavations (Mazar and Mazar 1989:3–121). F1 (Figs. 18, 19). A small rock-hewn winepress was exposed that consisted of a treading floor (L210), a settling pit (L204) and a collecting vat (L206). A short, hewn pipe (L205; length c. 0.15 m, diam. c. 0.15 m) connected the treading floor (c. 2.5 × 3.0 m, depth 0.1–0.2 m) to the settling pit (c. 0.1 × 0.8 m, depth c. 0.6 m). 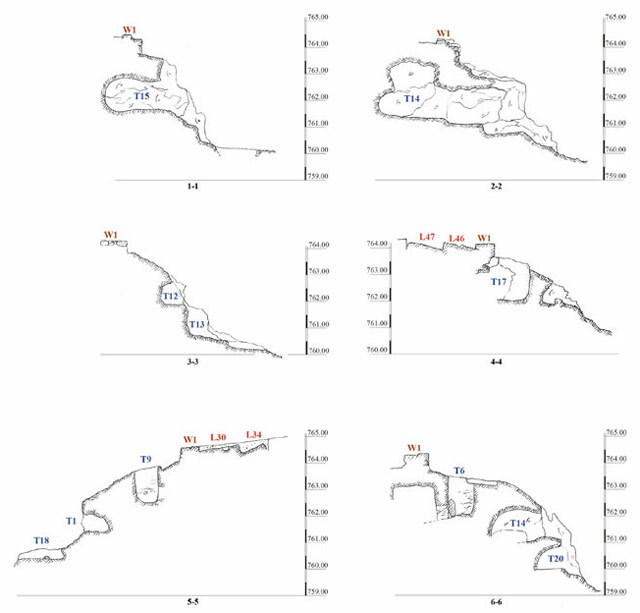 In the eastern wall of the treading floor were two small hewn sumps (L202, L203; c. 0.25 × 0.30 m depth c. 0.5 m) and a small shallow sump (L209; diam. 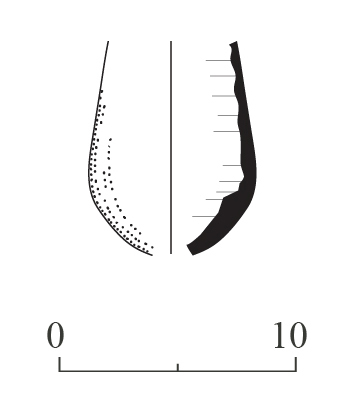 c. 0.3 m, depth 0.15 m) was hewn in the bottom of the settling pit, from which a pipe (L207; length c. 0.3 m, diam. c. 0.1 m) led to the collecting vat. The collecting vat was square (L206; c. 1.3 × 1.4 m, depth 1.8 m; Fig. 20). Numerous natural depressions were noted in the bedrock around the winepress. The soil that had accumulated in the winepress yielded several pottery sherds dating to the Roman period. F2 (Figs. 21, 22). 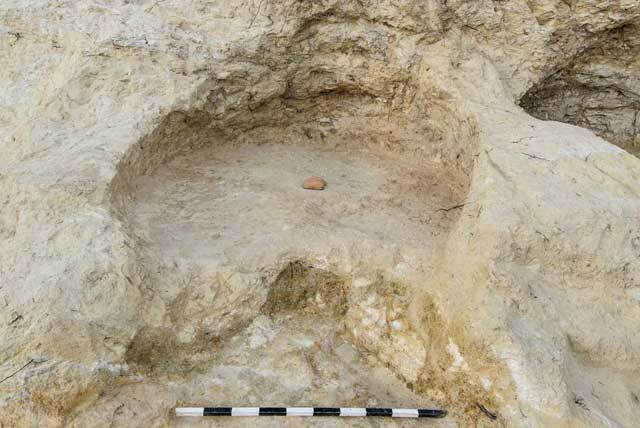 A rock-hewn winepress was exposed that included two adjacent treading floors (L221, L224), a settling pit (L222) and two collecting vats (L227, L229). The treading floors (L221—c. 2.5 × 3.0 m; L224—c. 2.5 × 2.5 m) were connected to each other by a narrow, shallow channel (L225; length 0.2 m, width c. 0.1 m, depth c. 0.1 m). A rock-cut channel (L226; length c. 0.3 m, diam. c. 0.1 m) linked Treading Floor 221 to Settling Pit 222 (c. 0.3 × 1.0 m, depth c. 0.8 m), which was connected to Collecting Vat 229 (diam. c. 1. 4 m, depth c. 1.5 m) by a bell-shaped rock-cutting. Treading Floor 224 was connected to Collecting Vat 227 (c. 0.5 × 1.1 m, depth c. 0.5 m) by a small hewn channel (L223; length c. 2.0 m, width c. 0.15 m, depth c. 0.1 m). A sump (L228; diam. 0.3 m, depth c. 0.2 m) was hewn in the bottom of Collecting Vat 227. The soil that had accumulated in the winepress was mixed with several pottery sherds from the Roman period. F3 (Figs. 23, 24). A plastered rock-hewn bell-shaped pit (L237; diam. c. 2 m, depth c. 1.8 m) that had a square opening (L232; c. 1 × 1 m) was exposed. Two deep sumps (L231, L234; diam. c. 1 m, depth c. 0.4 m) and two small round sumps (L241, L242; diam. c. 0.25 m, depth 0.15 m) were found around the pit. A rock-cut rectangular installation (L235; 0.6 × 1.5 m, depth c. 1 m) was unearthed southwest of Pit 237; an accumulation of soil containing pottery sherds from the Roman period was found inside and around the pit. 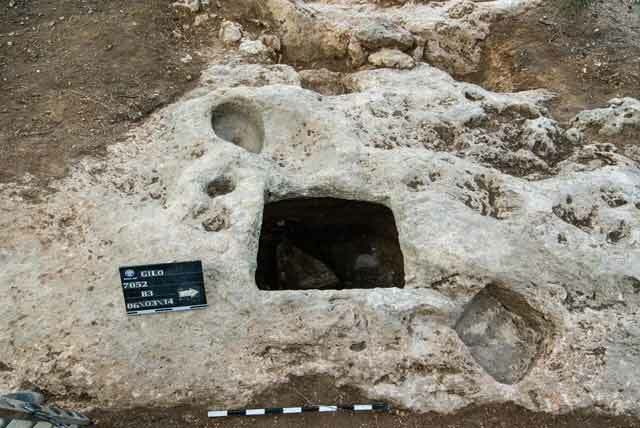 Apparently, the hewn caves, shafts and niches discovered in Area A were the remains of tombs dating to the Intermediate Bronze Age (Early Bronze Age 4), some of which had collapsed or were not preserved. Some of these tombs were severed by a quarry, which, based on the ceramic finds discovered above it, seems to date to the Early Roman period. Agricultural terrace retaining walls were constructed on top of the quarry, thereby postdating the quarry. The installations discovered in Area B contained meager finds from the Roman period that assist in dating the installations. Amiran R. 1971. Ancient Pottery of the Holy Land: From its Beginnings in the Neolithic Period to the End of the Iron Age. Jerusalem (Hebrew). De Groot A. and Bernick-Greenberg H. 2012. The Pottery of Strata 12–10 (Iron Age IIb). In A. De Groot and H. Bernick-Greenberg eds. Excavations at the City of David 1978–1985 Directed by Yigal Shiloh VIIB. 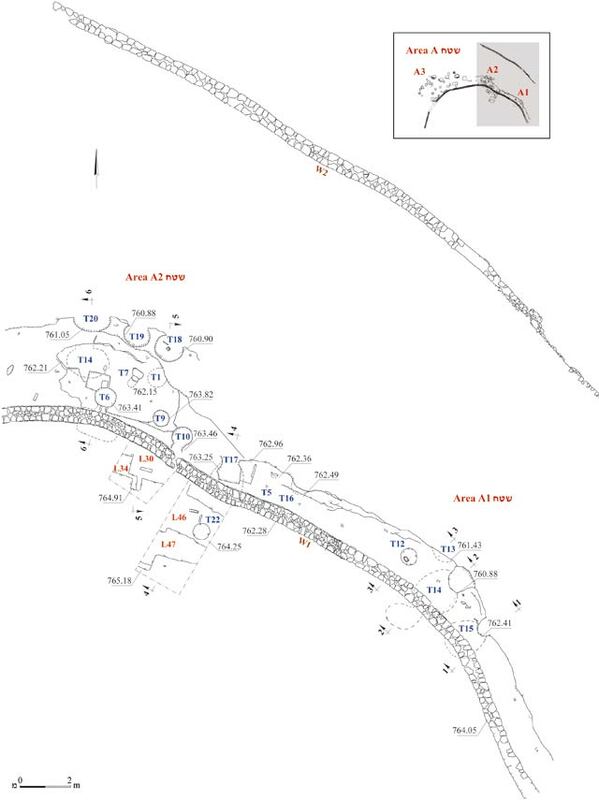 Area E: The Finds (Qedem 54). Jerusalem. Pp. 57–198. Gonen R. 2001. 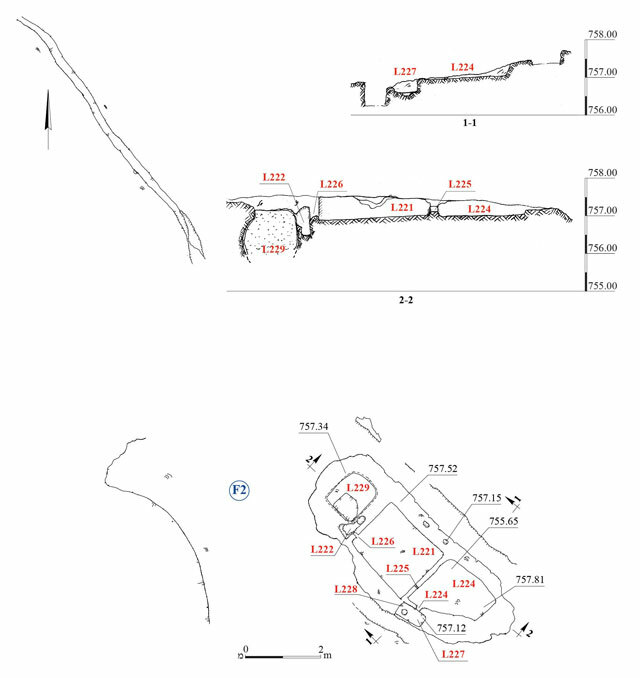 Excavations at Efrata: A Burial Ground from the Middle Bronze Ages (IAA Reports 12). Jerusalem. Mazar E. and Mazar B. eds. 1989. Excavations in the South of the Temple Mount, the Ophel of Biblical Jerusalem (Qedem 29). Jerusalem. Smith R.H. 1962. Excavations in the Cemetery at Khirbet Kūfin, Palestine (Colt Archaeological Institute. Monograph Series 1). London. 3. Areas A1, A2, plan. 4. Areas A1, A2, sections. 5. Area A3, plan and section. 6. Area A1, Caves 14 and 15, looking west. 7. Cave 15, looking west. 8. Pottery from Cave 14. 9. Area A2, looking south. 10. Cave 18, looking southwest. 11. A lamp on the floor of Cave 18, looking southwest. 12. A lamp from Cave 18. 13. A dipper juglet from Cave 17. 14. A rock-hewn shaft (L22) and the quarry, looking northeast. 15. Pottery from Tomb 22. 16. Cave T2 and the western part of Area A3, looking southwest. 17. Burial Cave 30, looking south. 18. Area B, Winepress F1, plan and sections. 19. Area B, Winepress F1, looking north. 20. Area B, Collecting Vat 206, looking west. 21. Area B, Winepress F2, plan and sections. 22. Area B, Winepress F2, looking northwest. 23. Area B, installations (F3). 24. Area B, installations (F3), looking southwest.